Vodka crust?! Have you lost your mind?! That's surely what some of you are thinking. But stay with me here. This comes approved from the good folks at America's Test Kitchen, the premiere destination for home cooks with a desire for scientifically perfected recipes. This was one of the dishes Christopher Kimball spoke about at a recent event unveiling the test kitchen's new cookbook: The Science of Good Cooking. I'd seen their vodka pie crust recipe before, but hadn't thought about trying it. Kimball's explanation for why it works convinced me. Water, when mixed with flour, promotes the formation of gluten, the protein that makes bread products chewy. While that might be nice in a pizza crust or a baguette, chewy isn't really what we're looking for with pie crust. We want something flaky. That's where the vodka comes in: replacing some of the water with vodka, which is generally 40 percent alcohol, inhibits gluten formation. And, as the crust bakes, it also evaporates faster. The result is a flakier crust with no vodka aftertaste (really). If you don't take my word for it, read America's Test Kitchen's explanation here. 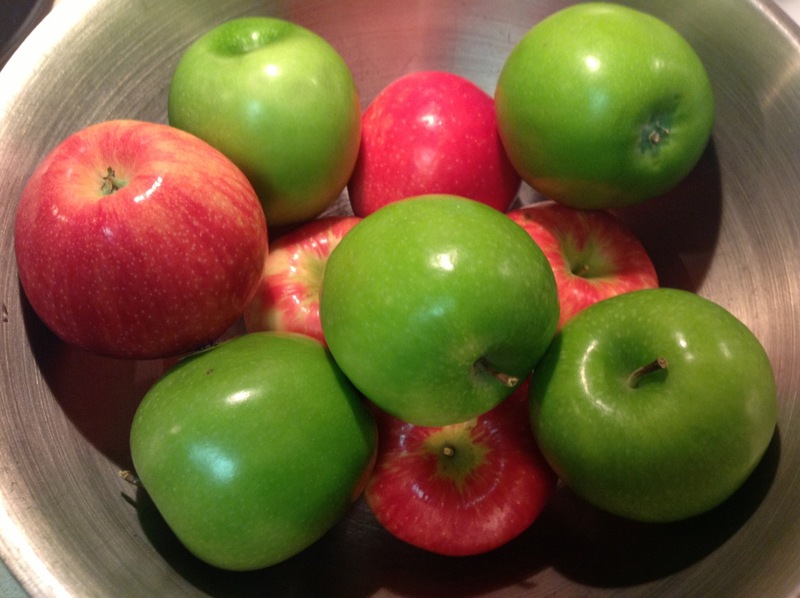 A pie will hold a lot of apples; ATK recommends using 4 pounds. Mound the cut apples in the middle of the pie. This crust recipe is pretty easy too. I've been making it sans vodka for years. It comes together in the food processor, so there's no need for a pastry blender. The only major deviation I make to ATK's recipe, is that I make mine with all butter, rather than a butter/shortening mix. I find I like the flavor better and the butter crust handles just fine for me. 1. Combine 1 1/2 cups flour, salt and sugar in a food processor, about two 1-second pulses. Scatter butter over dry mixture and process until the dough starts to collect in uneven clumps, resembling cottage cheese with no uncoated flour, about 15 seconds. Scrape sides of bowl with rubber or silicone spatula and redistribute dough evenly around the blade. Add remaining cup of flour and give 4 to 6 quick pulses until dough is evenly distributed and the mass of dough has been broken up. Empty mixture into bowl. 2. Sprinkle vodka and water over dough mixture. With the spatula, combine the liquid with the dough using a folding motion, pressing down on dough until it sticks together (use your hands a little if needed, but be careful not to overwork the dough). Divide dough into two pieces, roll into balls and flatten slightly to form thick 4-inch discs. Wrap in plastic and chill at least 45 minutes, up to 2 days. 3. Preheat oven to 425 F with oven rack in center position. Remove dough from refrigerator and allow to warm slightly if still and very cold. On a floured surface, roll out the first disc to a circle with an even thickness and 12-inch diameter. Gently fold dough into quarters, lay in 9-inch pie plate and unfold so that dough has an even overhang around the rim of the pie plate. Refrigerate while preparing the apples. 4. Peel, core and chop the apples into 1/4- to 1/2-inch slices. Put in a large bowl and toss with the sugar, lemon juice, lemon zest and spices. Transfer the mixture to the dough-lined pie plate, mounding the fruit mixture in the middle. Roll out the other dough disc to a circle with an even thickness and 12-inch diameter. Place the second dough round over the pie. 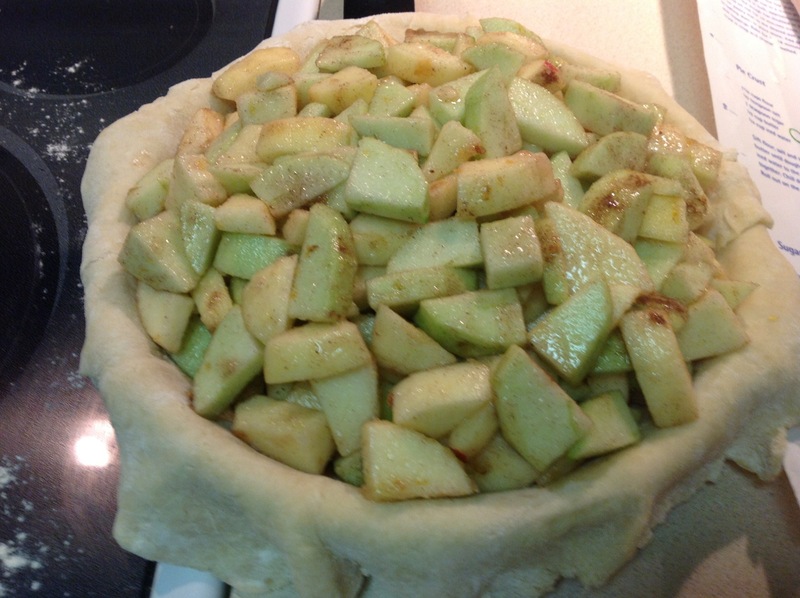 Trim the top and bottom edges to 1/2-inch beyond the pie plate lip. Fold the 1/2-inch overhang underneath itself so the folded edge is flush with the plate lip. Use a fork to flute the edge and seal the top dough to the bottom. Cut a few slits on the dough top. Sprinkle top of pie with cinnamon-sugar. 5. Bake until pie is golden, about 25 minutes. Reduce oven temperature to 375 F and bake another 30-35 minutes until the pie is bubbly and golden brown (from my experience, the pie may need up to 10 minutes of additional baking time). Place on a wire rack to cool. 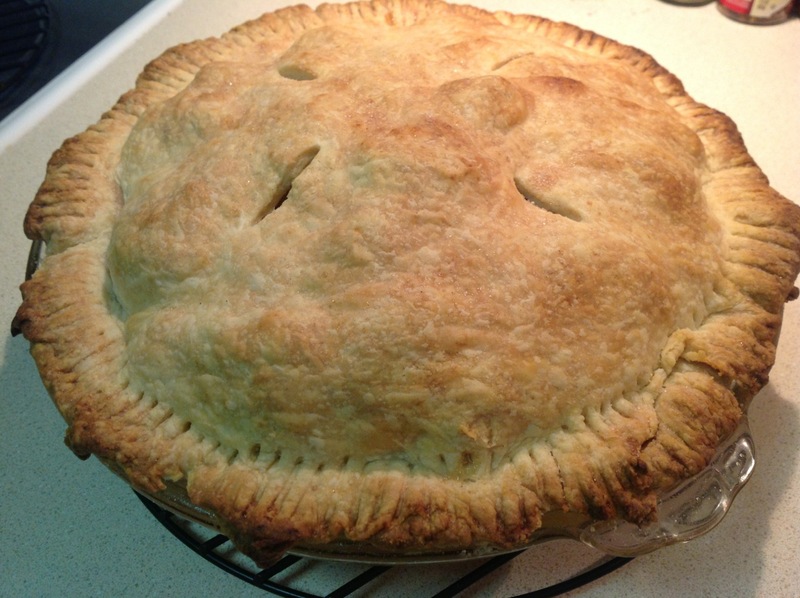 Another amazing apple pie from my husband. The vodka addition was inspired. You couldn't taste it, but it helped make the crust flaky and delicious. Bravo! It doesn't have to be vodka. Any spirit will do. For apple pie, I prefer to use Amaretto because I like the subtle almond flavor. Peach schnapps for peach pie is obvious, as is banana liquor for banana cream pie. I like bourbon for pecan pie. This is a great idea...thank you!!! That makes sense and what a great idea to pair flavors. The bourbon crust for pecan pie sounds particularly interesting. Thanks for sharing. I have to share this this fall! Thanks Wendy! By the way, I have a number of apple ideas for the fall. Using Vodka in pie crust is no secret, nor is it anything new. My mother-in-law, who immigrated from Poland in 1960 used vodka in her pie crusts, & paszka which is an Easter bread, all of her life. It's quite common over there. I love this pie! I crust is amazing and the filling is perfect. I have made the original twice and tried all the variations from the cookbook; the original is our favorite. Our other favorite pies from this cookbook are: Lattice-Top Peach, Summer Berry, Triple Chocolate Chunk Pecan, Buttermilk Chess, Lemon Meringue, Vanilla Cream, Banana Cream, Butterscotch Cream, and Coconut Cream. I still want to try the Pecan, Maple Pecan, and Lemon Chess. I love this cookbook and bake and cook from it almost every day!